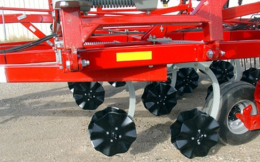 Quickly level out your seedbed and cut down on residue with a vertical tillage solution from Flaman. We carry an attachment from Wil-Rich that connects to your chisel plow to become a vertical tillage tool; an easy and cost-effective option to help dry and aerate your fields. The vertical tillage attachment is also capable of working in wet and sticky soils, thanks to the uniform down pressure on the shanks that act as a scraper for the coulters. The design of 1-3/4” wavy coulter provides a more aggressive action to break down heavy trash at high speed. Flaman takes great care to provide a variety of solutions for your tillage needs. If you are looking for more information or are interested in viewing all that we offer, visit one of our 9 dealerships across Saskatchewan, Manitoba or Alberta to meet with one of our expert farm sales team members. They’ll be happy to help you find the right equipment to match your needs.